It was the only goal the Red Bulls would need in a 1-0 win over DC United on July 25. 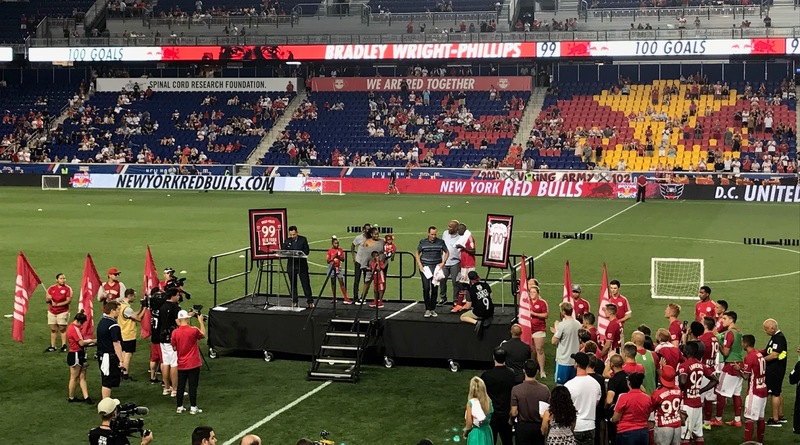 The Red Bulls also announced that Wright-Phillips' number 99 will be retired by the club. 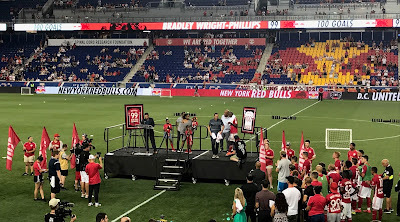 Wright-Phillips addressed the media after the ceremony in which he started off by saying, "First of all, I want to thank you guys for all the criticism over five years -- no, I'm joking. Honestly, thank you for covering me. You've said some nice things, yeah, and it's been a nice journey, so thank you, keep it up. Keep the nice remarks. We'll have a good relationship." Q. After coming here almost 5 1/2 years ago, did you ever think you would have this type of success here in Major League Soccer? BRADLEY WRIGHT-PHILLIPS: No, I can't lie, no. I didn't think -- I definitely didn't think I'd get a hundred goals. I think, me as a person, I don't think that far forward, anyway, but to have a number retired and (Sporting Director) Denis (Hamlett) and (General Manager) Marc (de Grandpre) to be saying those kind of things about me is the last thing on my mind. BRADLEY WRIGHT-PHILLIPS: Sorry to cut you. It was amazing. People, you know -- once I'm there and I see it and all the fans stayed behind, that's another thing -- thank you for saying behind, that was amazing. Yeah, it's overwhelming. I really appreciated it. Q. You've established yourself as a club legend and you've scored goals over the last five, six years but you're 33. Do you want to finish your career out here with the New York Red Bulls and if so, how much more time do you think you have? BRADLEY WRIGHT-PHILLIPS: Good question. I don't know, I feel good. I feel fit, sharp. I said from the beginning of the season, this is my best off-season. I've done a lot of work and this season, I feel way better than I did last season. Yeah, and to your other question, if it's up to me, football, you can never say -- whenever it's up to me, I'll stay here forever. Q. I wanted to take you back to that first season when you came in midway point, season ends, and I think you have one goal that year, some growing pains coming in. When that year ended, did you feel like -- did you know you wanted to stay or was there some doubt? What was your mind-set after that first half of the season? BRADLEY WRIGHT-PHILLIPS: Yeah, it's not often someone comes in straightaway and explodes. I had a hamstring injury and I wasn't in the team all the time, so I didn't think I'd be gone, I didn't know how things worked here; I'm just working my way in. Maybe when I look back, it's lucky they kind of kept me. Looking back, I fought my way in, and I thought, I'll have another year, but who knows. Q. How important was it to get this win with everything that was going on, and just your pass to Royer, your decision there? BRADLEY WRIGHT-PHILLIPS: Yeah, so the win today, you're saying? Yeah, I won't lie to you, in the car -- because I knew something was happening today. I was thinking, imagine if we lose and they are doing all -- you know what I mean? And then you're asking fans to stay behind and clap for a player and you don't know how you're going to play that day, so very important. Well done Danny Royer. He's in a better position than me -- maybe I can score but he has a better chance to score. I think it's the obvious decision. BRADLEY WRIGHT-PHILLIPS: That's important, by the way. I was blocked. Q. How does that affect you the rest of the game? It seemed like it was a game you maybe seemed tired in the final third and there was a lot of shots for you guys but not a lot of shots on target? BRADLEY WRIGHT-PHILLIPS: I don't know, I think we started great. I think we were creating a few chances. I think we were better the early part the first half -- I was happy to keep going how we're going. At home, it's not often we don't score. I was kind of happy with it -- I don't know if he wasn't, I have to watch it back, but I was kind of happy with the first half, especially. Q. Just coming back to, more so, your way here, you came from Manchester City and everything, and your family having such a legacy in England. How is it to make your own name here in America for you and your family and here in MLS? BRADLEY WRIGHT-PHILLIPS: Yeah, it's kind of the plan. I wouldn't say the full plan. Like I came here to kind of get away from England and yeah, make my own name for myself. I didn't realize how much I was in the shadows. I had had that question so many times but I didn't realize I was in the shadows until I came here and it was good, because not a lot of people knew who my dad was, I don't know if they followed Arsenal in those days. So it was nice to be Bradley Wright-Phillips and not Ian's son -- was that all answer all right? You had kind of a blank stare on your face. Q. LAFC is a team that's known to stumble late, late goals. Seemed like late on you were pressing like you felt something might be there. BRADLEY WRIGHT-PHILLIPS: I think that's something we spoke about in the week but to tell the truth when you're in the game, I personally don't think, you know, are they normally get tired around there. I just think we're a very fit team. So sometimes if towards the end of a game, if it looks like we're all over a team it's because we train like this. We train like this. Our preseason's tough. We know if we can stay in the game towards the end, it will probably be on our terms. Q. Marc mentioned it during the ceremony, the three head coaches, and I just wanted to get your perspective on playing for pecky, Marsch and Armas, and when Armas was hired, there was a video of you embracing him during practice. How important is it for you to step in in that situation and what has your relationship been like in a club where Marc said you're kind of the one constant through this whole period? BRADLEY WRIGHT-PHILLIPS: Yeah, there's not many of us, you're right. I just tried to be me. I think all of the coaches have brought something different, and yeah, and brought something out in me. Each year I've tried to just become a leader and do what I can with the young guys around the club. I think -- sorry, what was that -- I was rambling on there. Q. How has it been different, each coach, and how important was it when Chris was hired, embracing being the star player? BRADLEY WRIGHT-PHILLIPS: Well, I think when Jesse came in, it changed from almost superstars to a hard-working young bunch of honest guys. With the transition with Chris, because he's been there the whole time, not much changed in how we're going to play and our outlook on, yeah, what we want to get from games, but it's just the personality switch, really. Chris is a lot more relaxed. Yeah, the details don't really change too much. With Jesse and Chris, there's not too much changed. Red Bulls Head Coach Chris Armas said of what his favorite things are about Wright-Phillips, "Look, every so often, a guy like this comes around and you can only be so fortunate to spend some time with a player and a person like this. "So for every young player, either in our academy and comes through, and first-team player, how for fortunate that they can watch a guy and remind guys -- and I tell players, watch this guy: Watch how he shows up every day and watch what real work looks like. Watch how he interacts people. Watch how he takes to Nancy, the woman who prepares our food. Watch how he deals with the bus drivers, and it goes on and on and on. "He gets it. He gets life this way. And you watch him with his family and then you really understand, and as Denis said earlier, what he does in that second goal, he's knackered at that point, right, but he's fighting and he knows he's going to get a chance and sure enough, in his fashion, he passes it perfectly. "That's the gist of it with him. And I'll tell you, in all the years, there's not so many guys that have such an ease around. He's a superstar, he really is. "We should all be fortunate that we're watching a guy, that we get to see him up close and me that gets to work with him for these four years and he has such an ease. How is it possible for an 18-year-old, he roomed with Cristian Cásseres this last trip and it works, he can do that. He speaks and people listen. Again, he has shown the way. What a legend. So today, to see him have to suffer a little bit after the game in that ceremony, I think, as they said, enjoy the few minutes. "A special moment with or for Brad, I'm not sure (laughter). You know, tonight was one of them, just seeing him have to sit back and accept the recognition for once, because he never wants it, and we forced it on him. I told him before the game, it's not our fault. You scored the hundred, not me, you know what I mean, so you've got to take the recognition."